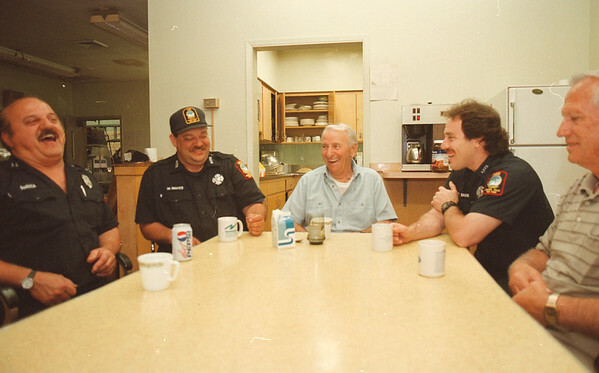 6/19/97--HEART ATTACK SURVIVOR--DAN CAPPELLAZZO PHOTO--(LTOR) CHESTER HYLA, OF GRIFFIN ST., CENTER WITH CIVILIAN SHIRT, SPEAKS WITH BOLLIER FIRE STATION CAPT. BART DeROSA, WILLIAM MAYES EMDT WHO REVIVED MR HYLA. PAUL BARR, WHO ASSISTED WITH RESCUE AND HYLA'S NIEGHBOR/RETIRED NF FIRE CAPT. KENNETH BOWSER. MEET AT THE BOLLIER ST FIRE HALL TO RECOUNT THE EVENTS OF THAT DAY.